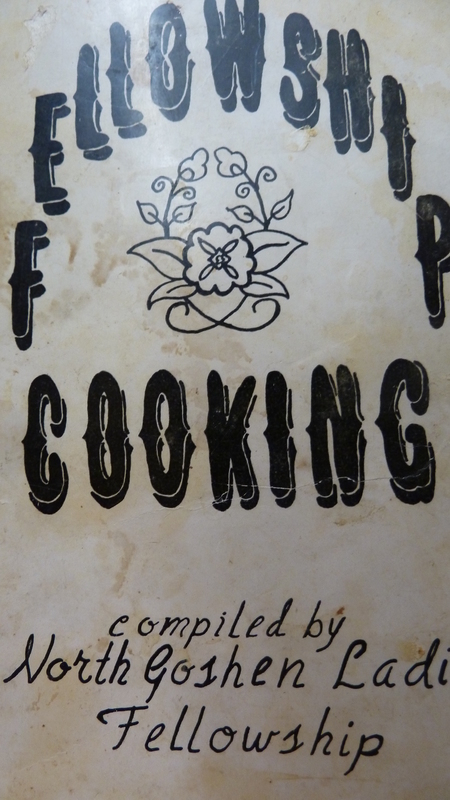 Cherry Delight, cooking, George Washington Pudding, Mennonite cooking, recipe, Whatever Happened to Dinner? 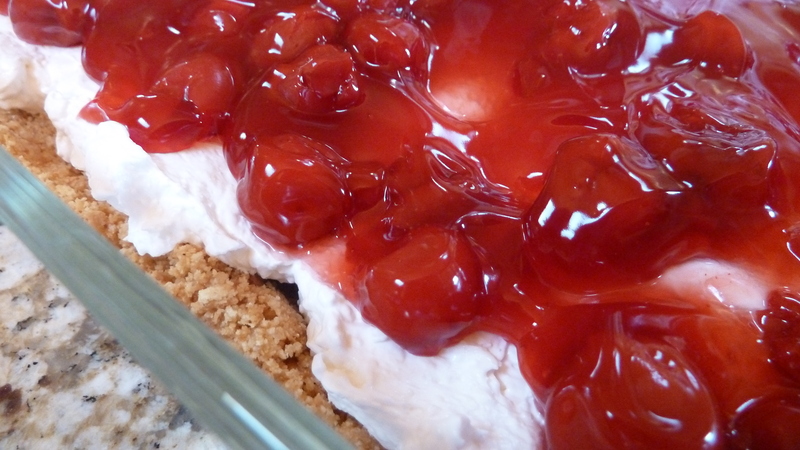 This is a recipe variously known as Cherry Delight, George Washington Pudding, and probably some other names. Google it, you get plenty of options and photos and all of them a delight to look at. I loved it as a child and my mother made it from a recipe in our church cookbook which was called “North Goshen Fellowship Cooking,” one of those marvelous collections which is generally only special to the families of the particular church. In that book a recipe called “George Washington Pudding” (so named I’m sure because of the generous use of cherries from canned cherry pie filling) uses 2 eggs mixed with cream cheese and baked for 25 minutes at a low temperature before you add your cherry pie filling with whipped cream on top. The baking was a bother. 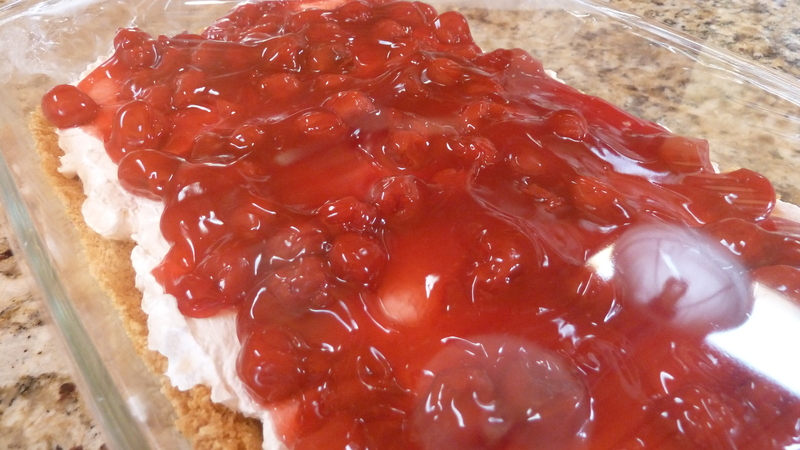 Eventually I found a much easier and better recipe just called “Cherry Delight,” and what is special now is that it came from the kitchen of a woman who became a teacher for at least 2 of my daughters, and a beloved one at that, Sara Ann Showalter. 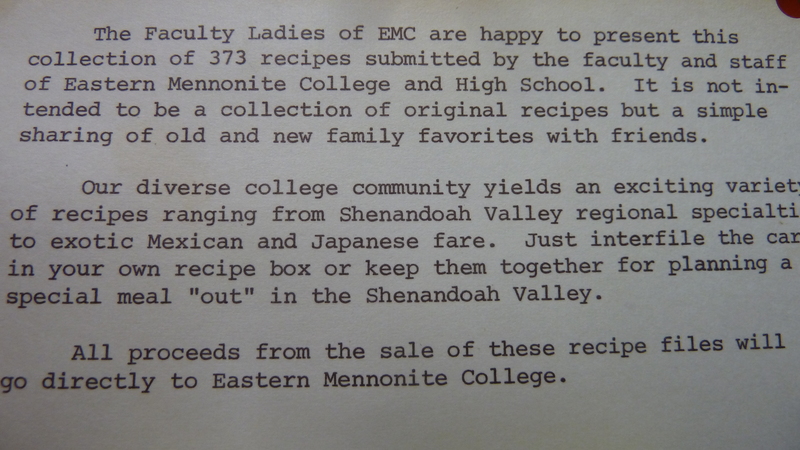 But the back story is that the recipe card comes from a recipe box collection created by the faculty, staff, and spouses of what was then Eastern Mennonite College in a valiant fund raising effort of some kind on behalf of the college. I do not know or recall the particular financial crisis but I’m sure it was some threatened budget cuts which the faculty rallied to raise some funds—token, I’m sure. (See notation at the bottom of this card. Also note they were called “the faculty ladies.” Click on card to enlarge as needed.) The cards were hand typed and then printed off and cut into the proper 3 x 5 standard index card size. 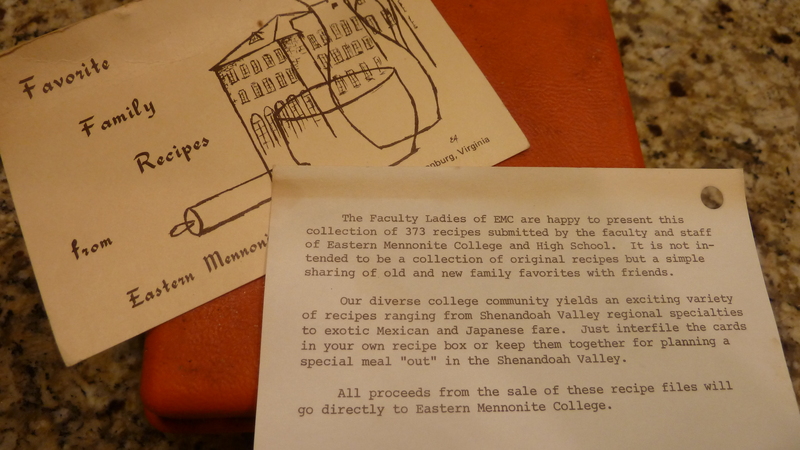 But the memorable part of this effort was that someone came up with the idea to collect the recipes onto cards and real boxes (plastic). Students, families and staff spent an evening in the North Lawn basement cafeteria collating the collection. 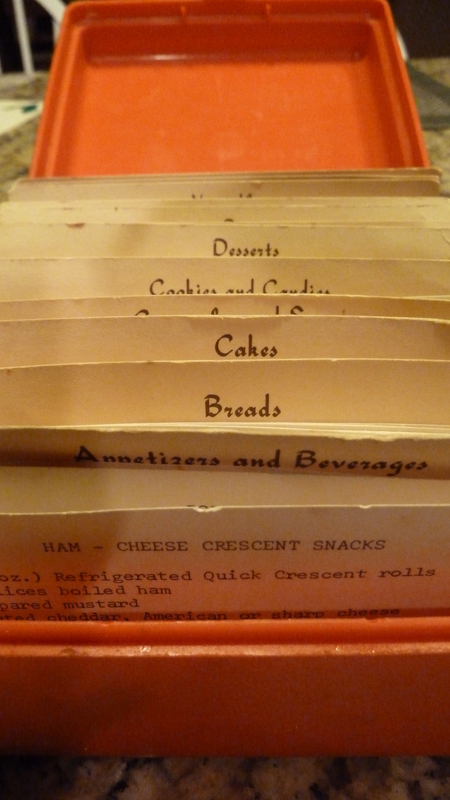 The index cards were laid out in proper order on the dining room tables and each volunteer would go up and down the rows adding recipe card after recipe card in order. The names on the cards are a trip down that memory lane for sure—Anna Frey’s “Orientation Punch” which she served to me in her home when I was in her freshman orientation group, and who died much too young of a heart attack. Mix together and pat into 9 x 12 baking dish. Press down with hands to flatten (can use waxed paper if you don’t want to use bare hands since this is not a baked crumb crust). Chill in refrigerator for 15 minutes to harden. Mix together and beat with mixer to combine well. Spread layer of cream cheese mixture onto the Graham cracker crumb layer (a bit challenging, but take your time). Spread 1 can cherry pie filling on top. Chill. Cut into squares to serve. Delicioso! My family all loves it, especially my youngest, who often requests it instead of a birthday cake, and even tried to make it the semester she was a student in Scotland using canned cherries (without any cornstarch), spray whipped cream (the only kind she could find that didn’t require a mixer) and the sprayed cream of course lasted only long enough to become a disastrous mess. It went down in infamy. I have a photo she sent but, perhaps mercifully, I can’t find it now. * Sara Ann Showalter taught fourth and second grades (and maybe some others) at Linville-Edom Elementary School for many years, a beautiful woman and awesome teacher. She died much too young too, of cancer. I remember her “grandparent” circle–a day when the children invited grandparents or other beloved senior citizens to come to school to share memories and traditions. Her husband, Millard, had a hobby of memorizing and reciting poetry and long passages of scripture. He’s still living and regularly greets guests at the nearby (country) McMullen Funeral Home. What memories or persons do the cards in your recipe files bring to mind? What memorable fundraising projects do you recall from your school or college days? 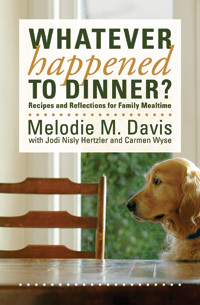 For more favorite recipes see my book, Whatever Happened to Dinner: Recipes and Reflections on Family Mealtime.